Jennifer picked out a white dress with ruffle skirt for Bailey. Marriage means your family and friends will be at your side on your big day. Such the case was with Jennifer Hindieh who knew that she wanted her family and friends and her lovable dog Bailey to be right there with her. To live her big dream she came up with the brilliant idea, and that was to give her dog the respect she deserves. Jennifer and her then boyfriend, now fiancé adopted Bailey from the North Hempsted Animal Shelter in New York when, she was five months old. When they got engaged last October, they knew they wanted her to be as involved in their big day as possible. 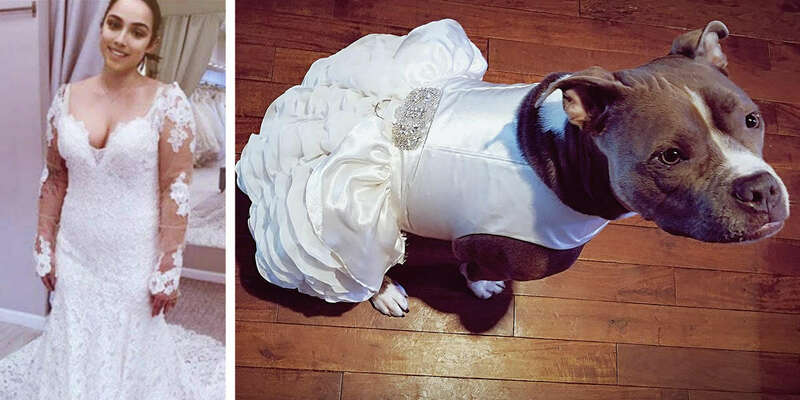 Jennifer decided to walk down the aisle with Bailey and her dad, so when she was choosing a dress, she realized her pet would need something to wear too. She looked online and found a company which makes dresses for dogs. Jennifer picked out a white dress with ruffle skirt and diamante detail for Bailey to wear to the wedding in September. She posted a picture online and said: ‘Her dress is fancier than mine. Now all she needs to remember is not to jump on dad when she gets down the aisle.’ Apparently they’re getting her a mini dog wedding cake too to make the day just as special for her as it is for them.